It was a day late in the month of December, as I was hanging hand knit socks to dry on my drying rack, realizing that I didn't have anymore socks hand knit socks in the sock drawer, when I made the flippant statement to the universe. "I need more socks. 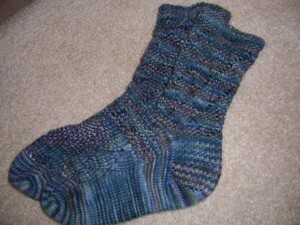 My goal for 2011 is another 12 pairs of socks into the sock drawer." Well, I hate to let anyone down and that includes myself, but knitting happens in fits and starts around here lately. What had I gotten myself into? Well, with a little cleaning out of the knitting basket that hides beside the couch and a little bit of kitchnering and tucking in ends, I was off to a good start. There were quite a few green socks in that bin, and even a couple of pairs. (hmm, I wonder where the yarn and pattern are for that single sock...) So, two pairs down, I spent much of February knitting away on a simple pair of "dollar" socks that I started for car drives to wineries and then took seriously and finished one at the January board meeting (as those meetings require mindless knitting so that I can pay attention to the business at hand). 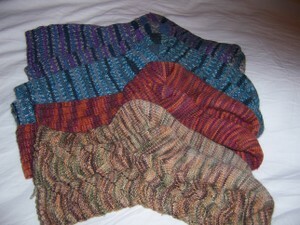 I finished them up while in Tacoma for Madrona, the best fiber festival ever. With 3 pairs done, I cast on another mindless pair (as there are always car trips that call for mindless knitting). I am now 3/4 of the way through my "winery socks" named for the color and the knitting that was occurred back and forth to the wineries. So that puts me at almost 4.5 pairs and here we are half way through the year. I better pick up the pace on this knitting goal. While the East Coast was digging out from two consecutive snow storms in February, as soon as the airport was flying planes, I headed west to the glorious city of Tacoma. (To be honest since I barely left the hotel, I can't really comment on Tacoma other than the fact that they lacked snow and that was enough to make it glorious to me). The occasion was the Madrona Fiber Arts Winter Retreat. A great event should you be looking for some fun in February. I had missed my class with Kathryn Alexander due to the snow situation but had a fun class with Betsy Hershburg (check out that link she makes some incredible stuff). The class was on knitting beaded jewelry and it had the added bonus of resulting in a finished project. After finishing this fun bracelet and a matching pair of earrings that still need findings, I ran around showing it to everyone who would listen. One of the women who shared the airport shuttle back with my teacher, Betsy, Stephanie, and a few unsuspecting non-knitting muggles, shared the sage advice: "Go home and make another as soon as possible." About a week after I got home I stopped by my local bead shop (is that a LBS?) and picked up some tubes of beads. I came home and tried a few gauge swatches. I then stopped by my other local bead shop and bought more beads. It seems I had rekindled my bead interest from high school (when I had to have my dad stop by the San Francisco bead shops when he was out that way for work). This spring break I became a little excited about the whole process. I then realized how much I was spending on the individual clasps at Potomac Bead and ordered 4 dozen off the internet and I just received them in time to put them on the other 5 bracelets that I have made while waiting for them. I will take care of the finishing and take pictures and get them posted soon. I am fallible and make mistakes and I can take the responsibility and correct them. I found those missing needle tips -- right where I had left them. With the monkey romper which was stalled when I forgot to decrease for the arms while completing the monkey. I had pulled out the monkey's head down to the mouth and then reknit it but I wasn't careful enough and got the rows off and it seemed wonkey so I pulled it out again tonight and I am still not sure there isn't an extra row in one or another of the colors but here is where it stands... Just to the monkey's eyes, a row or four rows into the decreases, I lost quite a few unnecessary rows when I pulled it out this second time, I am hoping that counting rows instead of measuring will serve me well. I have a bit of headache and so I am putting it aside for tonight and will look tomorrow to see if I am going to pull it out for the third time or pray for the power of blocking. My goal is to finish this romper by the end of the week. Have you ever had friends where at some point they differences between friends and family gets a little blurry? Oh, and because I am super excited about it, Ruth and I are going to Wales this summer to visit her long lost relatives. I spent the weekend in Richmond attending meetings about my union's Strategic Management Plan, we are restructuring so all of the changes and therefor the documents need to be updated through voting, by several different elected bodies, to reflect the new structure. This weekend was round one. So there was lots of sitting in meetings, discussing changes and word choice and addressing people through the chair (full parliamentary procedure). I have a bad habit of not waiting to get on the speaker's list and so need to distract myself just slightly, so as not to just call out...so I knit socks. I finished the second of a pair that I have been carrying around since January sometime. They are make of Trekking and have been knit on a little here and a little there for several months. I am glad to have them done even as we move into summer as I have taken up ice skating to vary my exercise routine and I like to wear hand knit wool socks under my skates. I tried them out on Monday night and they worked great. Notes: These socks were pretty straight forward, chosen for mindless knitting while paying attention to something else. They were 72 stitches with a couple of inches of 2 x 2 ribbing followed by straight stockinette stitch. I have tiny feet so there was quite a bit of yarn left over when I was done. Hopefully I will come up with some fun use for this. Having finished my "carry around sock" half way into the meetings I found a knitting bag in my car that had some random sock starts in it and finished the first of a pair that I had begun at another union meeting back in August and was able to start the ribbing on the second sock the next day. Surely, I have mentioned before that my tastes run parallel to most 3 year olds? Back when Interweave Knits was pairing all of the sweaters with Crinoline and taffeta -- I had to make all of those sweaters and wished I could get away with the outfit. Pattern tights are one of my favorite things to wear (although I admit to not being that wonderfully eccentric or creative to pull off the look so I don't do it very often) and fun socks... well, I love fun socks. I learned to knit socks because a friend of mine who was a fairly new knitter wanted to knit socks. I found a pattern and just made sure I stayed ahead of her in the knitting so that I could advise her as she got to the next section. Then another knitting friend was having trouble with a pattern for socks - it was toe up and so I took it upon myself to learn to knit that way so that I could help her learn to knit socks and for a long while we met every Sunday at the local Panera Bread and knit socks (or mostly she knit socks and I worked on whatever I was working on, she has made a lot of socks) for what we called Sock Sunday. I taught Wendy to make socks and she ended up with three socks none of which were the same and none of which fit (to her credit she has since made many successful socks pairs). Pattern: Pomatomus by Cookie A. Notes: The pattern is well written but I think on more than one occasion I was thrown off by the shifting of the stitches before the next repeat and may or may not have fixed it. I kept forgetting and it would effect the ridges so I would tear out or make it make sense for me which isn't noticeable but is likely not true to pattern. It is a good thing that NABLOPOMO is in November and not in December because if I had to post every day this month I could never pull it off. Between things picking up at work and meetings and hockey games and social engagements (holiday parties and the like) I hardly have a chance to knit much less post. But there has been some progress on my December goals. A round or two on the Potomatatamu (why can I never remember what they are called) on the Metro on the way to hockey games and stripes added to the Silky Wool Jacket whenever I get a chance. 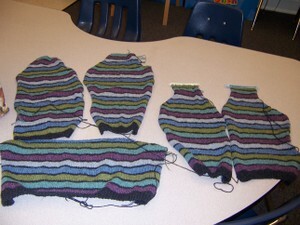 Here is the progress on the stripy jacket. I hope to finish it up by early next week. I just have to finish up the back and then the fiddly stuff like button bands and seaming. For those patiently waiting for pictures of Jade -- well our regularly scheduled photo shoot was interrupteed by the union holiday party and we didn't get any pictures. But I wore it yesterday and the fit is pretty well and the striping of the yarn isn't too noticeable especially when worn under a blazer which is what I had planned for it. Maybe I will be able to recruit another photographer to get those pictures so I can get that post up soon. As I have recently been updating my photo albums of finished objects, I realized that I had 12 finished objects last year (actually 13 one is not posted) and there were only 3 posted for this year before I added my mother's sweater and Ronnie. Well, surely I have knit more than that (and then you can look at the list of 15 or so projects on the needles and see that maybe I have but I sure wasn't finishing much. So I thought I would pick up a few more abandoned items before the end of the year. the Baby Trellis which is now too small for its intended recipient. start the seams on the log cabin blanket which hasn't seen a tapestry needle since whenever it was that I finished knitting it. As for my sweater looks like it will be done just in time. I have one seam left and I need to find a button for the collar since it seems I have a big head and it wouldn't fit over if I sewed up the entire collar. I have been drawn to buying color-work kits lately. I am knitting a simple basic sweater for my NAKNISWEMO sweater and it makes me even more eager to start some color-work. 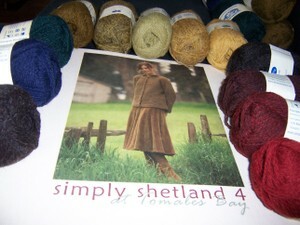 You may remember that I bought this kit at MD Sheep and Wool this year. However, I put off knitting this until the weather got a little colder. And then I was talked into getting this kit to participate in the Autumn Rose knit along. Well, since I haven't actually started any of these kits, I haven't slacked the thirst for color and another colorful sweater has called my name...and I have a slip from the PO but won't be able to make it there today so it will have to wait until tomorrow. 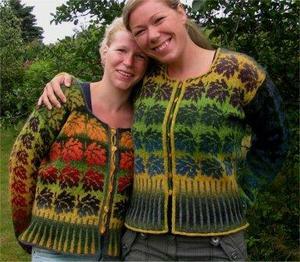 I think it is the yarn for this lovely sweater: Autumn by Ruth Sorensen. I better finish up the stockinette soon so I can start on the lace and finish Jade before I start casting on for color-work. I believe that I have mentioned here before that I am on the planning committee for the local Irish Festival and Saint Patrick's Day Parade. These meetings consist of sitting around a local pub (which is for sale if anyone is interested), drinking Guinness and getting harangued by the chairman about who isn't at the meeting, what didn't go right, what hasn't been done yet, how the city is screwing us over or some other perceived fault of the city employees, the volunteers or people not present (occasionally the haranguing will be directed at someone present but not usually). Well at the last meeting, I sat there knitting on my NAKNISWEMO sweater to keep me from being too bothered by the harangue or drinking too much Guinness. Two separate people came up to me afterwords and made a comment about Madame DeFarge from the Tale of Two Cities. 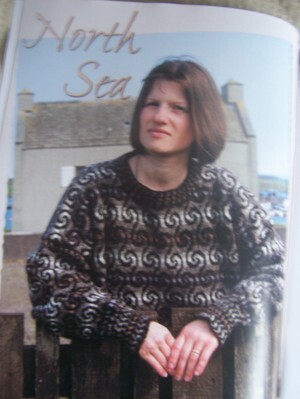 Is it that I am that cruel or just that it is the only literary reference to knitting these people have come across?